The Philadelphia Eagles defeated the New York Giants, 27-7, and find themselves atop the sluggish NFC East for the first time this season. Let’s start with the only normal quarter of football from last night: the first quarter. Two things happened: the Giants marched down the field on their opening drive and scored what turned out to be their only points of the game, and the Eagles scored a touchdown in the first quarter for the first time this season. The game was tied after the first quarter at 7, but the craziness was only beginning. There were seven turnovers in the game, including four by the team that ended up winning. The biggest turnover, though, was a pick-6 by Nolan Carroll II that seemed to completely swing the game in favor of the Eagles. The same team and head coach that was being mocked a short five weeks ago is now .500 and back atop their division. 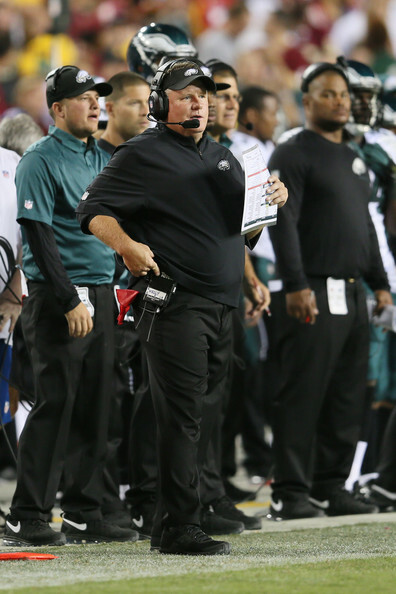 So what’s changed for the Eagles? Their quarterback is still committing way to many turnovers, with most of them coming in the red zone. The running game is not yet off life support, even though it has looked better the past two weeks. The special teams play has not been outstanding to the point of carrying this team to its three wins. The defense has been the most consistent, despite the injuries to their two starting middle linebackers. It’s called coaching, people. That same coach that was getting ripped left and right for being a racist and getting rid of all the good players and not going for it on fourth down in Week 1 against Atlanta is now seeing HIS team (slowly) come together. His 2015 third round draft pick Jordan Hicks played critical minutes last night at linebacker, filling in quite well for the injured Mychal Kendricks and Kiko Alonso. As November approaches with nearly half of the season behind us, the Eagles look like the team putting it all together just in time to make a run to the playoffs. The Giants, on the other hand, continue to prove they are the up and down team that they showed us they were in the first couple weeks. Bradford threw three interceptions against New York, and became the first Eagles quarterback to throw three or more picks and win on Monday Night Football. While most of the turnovers were a result of sloppy play, Philadelphia’s defense proved they can carry the offense if needed. 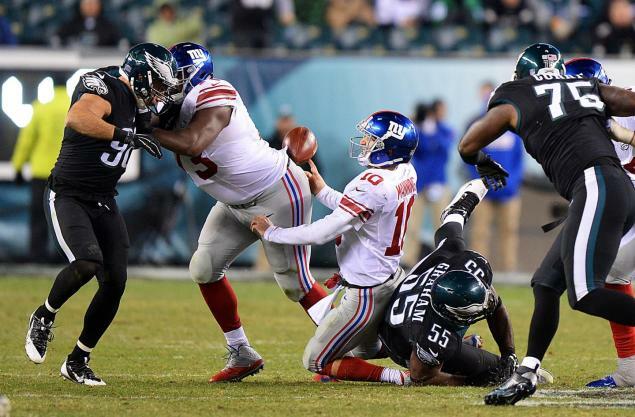 The Eagles sacked Giants quarterback Eli Manning three times, which many seem like a lot, but consider Manning was sacked only four times through the first five games of this season. Philadelphia’s defensive line proved once again this season they are legit, and as those championship Giant teams of the past know, a good pass rush with the front four can make up for deficiencies in the secondary. The Giants defense in this game barely got any pressure on Bradford, only sacking him once. While Bradford did turn the ball over a crazy amount, it’s hard to credit those turnovers to the Giants defense. Through six games New York’s defense ranks 14th in points allowed (22.7), 28th in yards allowed (391.5) and dead last in passing yards allowed per game (298.5). The one bright spot for the Giants defense is they do stop the run well, allowing less than 100 yards per game on the ground, which ranks 6th. The Eagles defense, on the other hand, ranks better than the Giants in all of those same categories: 6th in points allowed (18.3), 15th in yards allowed (354.8) and 19th in passing yards allowed (260.7). Philadelphia is also known as a solid defense against the run, and they currently allow less than 95 yards a game in that category, which ranks 8th. Not only is the Eagle defense better statistically so far this season, but they are also significantly better up front, which seems to matter much more towards the end of the season and especially in the playoffs. As I tweeted last night, the lack of a pass rush for the Giants makes their ceiling for this season a first round playoff exit. That’s their best case scenario, in my opinion. I can hear all of the Giants fans now: but what about their offense and all of the weapons they have? To what I have been saying all season, what weapons? 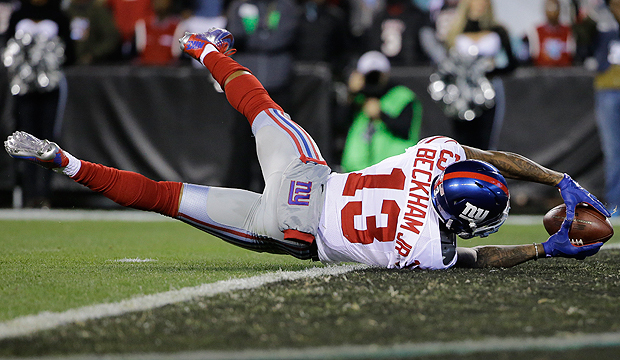 Yes, Odell Beckham Jr. is stud. That same stud of receiver was targeted only once in the second half and did not catch a pass last night in a game his team trailed. No one besides Beckham on the Giants offense scares me. They have a lot of solid pieces in Manning, Shane Vareen, Rashad Jennings, but against an above average defense all of those guys were no where to be found. Go ahead, Giants fans, take your shot back at my Eagles: they have no one that scares me on their high-powered offense, either. That can also be correct without it somehow overriding the fact that the same is true for the Giants. The difference between these two teams last night, and what will prove to be the difference throughout the season, was defense. And the defensive line that made the Giants so dominant and scary come playoff time when they were winning those Super Bowls is now ironically the same thing that haunts, and will continue to haunt this year’s team. This entry was posted in Home, NFL and tagged Chip Kelly, defense, defensive line, Eli Manning, interceptions, MNF, New York Giants, NFC East, NFL, Odell Beckham Jr, Philadelphia Eagles, sacks, Sam Bradford, turnovers, Week 6. Bookmark the permalink. ← Lions, Panthers and Patriots, oh my!